Emily's professional background includes forty years of experience in the dental profession as dental assistant, administrative assistant, and office manager. She has served as administrative assistant and office manager at Carroll County Endodontics since November 2005. Emily's sunny, friendly personality will immediately make your time in our office enjoyable. Please let Emily know of any questions or concerns you may have throughout your time at our office. In addition to her contributions to our dental team, she enjoys gardening, traveling, and spending time with family and friends. Lisa began working at Carroll County Endodontics in 2013. Her job at the front desk involves taking care of patient needs which include appointment scheduling, being a contact for you between your general dentist and Dr. Patel, as well as obtaining insurance benefits for your treatment. From the moment you walk into our office, it's important that you feel welcome and comfortable. Lisa is here to make certain that you do. Lisa has lived in Sykesville for over 32 years, and is married with two children. She enjoys spending time with family and friends, reading, and the great outdoors!!! Nicole started her dental journey at Carroll County Endodontics in 2013. She is a dedicated dental assistant who strives to get to the root of your dental problems while keeping you as comfortable as possible during your visit. Nicole has been assisting Dr. Patel with root canal treatments for over 5 years! Nicole is a lifelong Sykesville resident. When she is not assisting with root canal treatments, she enjoys reading, writing, and traveling. She also loves her dog. 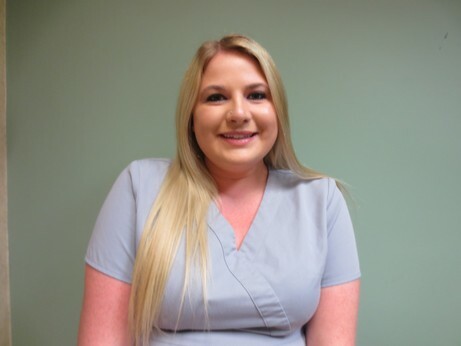 Shayna is a certified dental assistant who started working at Carroll County Endodontics, PC in October 2017. She really enjoys dental assisting. Her goal is to make you feel calm and comfortable during root canal treatments. Shayna has lived in Carroll County for 20 years. She enjoys traveling, hiking, and being with her friends and family.